Some of you may recall in January that my family was adopting a rescue kitten that we later named Dexter. He was a bit of a wild kitten rescued from a colony of cats, and we knew we had our work cut out for us as he was very shy and timid and skittish around humans. He did, however, fall in love with our other cat, Isaac. It has been many months since then, but Dexter had slowly gotten better and began to acclimate to his new home. 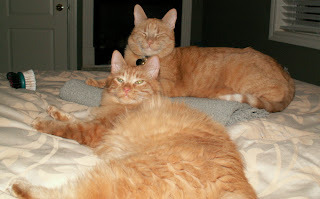 He followed his new big brother Isaac wherever he went and both cats benefited from the company of the other. This morning my mother called me up to tell me she was taking Dexter to the vet, saying something seemed to be seriously wrong. All afternoon the vet has been running tests and taking x-rays and a few moments ago we got the call; he has kidney failure. Why? We don't really know, for he is only a year+ old. My mother and I are devastated and are going ahead with the decision to put him to sleep later this afternoon rather than let him go on any longer. Perhaps we will one day find our hearts strong enough to bring another baby home, but the loss of two cats in 2 years is about more than we can bear. We will miss Dexter terribly.